Jerold J. Voboril, 78, of Bruno, died Thursday, September 7, 2017 at CHI St. Elizabeth's Hospital in Lincoln. Jerold Voboril was born November 1, 1938, in David City to Jerold and Agnes (Kozisek) Voboril. He attended area schools and graduated from Assumption High School in Dwight. He served six years in the Air National Guard. In April of 1965, he married Ann Humlicek. They had four children and she died in 1981. On April 27, 2001, Jerold and Beverly Kliment were married in Valparaiso. 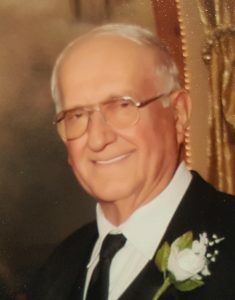 He farmed near Bruno, owned and operated Voboril Trucking, hauled grain and pulled trailers for the Butler County Landfill. Jerold was a very devout Catholic, loved polka music, old tractors and Czech food. He was always smiling and loved time spent with his grandchildren. He also enjoyed riding his motorcycles and four wheeler. Jerold was a member of the church and Po.L.K. of A. He is survived by his wife, Beverly of Valparaiso, three daughters; Carmen Wolfenden and Kevin Behrens of David City, Diane (Joe) Warland of Bruno and Susan Pernicek and Eric Schuller of Brainard, three sons; Dwaine(Victoria) Voboril, Lincoln, Patrick Voboril of San Diego, Richard Voboril of Bruno, 10 grandchildren and one brother, William (Eileen) Voboril and sister-in-law Theresa Voboril, all of Lincoln. He was preceded in death by his parents, first wife Ann Voboril, son Edward Voboril and a brother, Raphael Voboril.